Our research is focused on the immune system of Atlantic salmon and how this species combat viral infections. The knowledge contributes to an increased understanding of the evolution of the immune system and to improved vaccines for the aquaculture industry. Farming fish in dense populations in the open sea inevitably leads to outbreaks of infectious diseases. 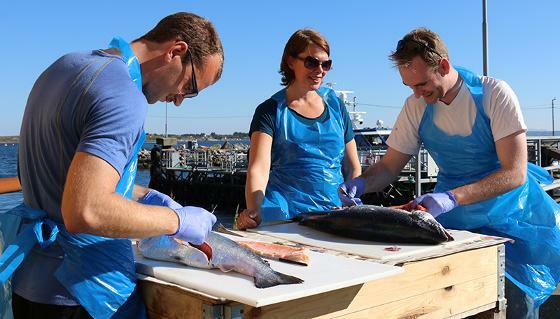 While vaccination has brought most bacterial diseases in Norwegian salmon farming under control, virus diseases are still a major threat having impacts on fish welfare and economy. At present the main viral diseases are salmon pancreas disease (PD), heart- and skeletal muscle inflammation (HSMI), cardiomyopathy syndrome (CMS) and infectious salmon anemia (ISA). Salmon virus vaccines have so far shown relatively low protective effect. A major goal of the research group is to contribute to improved virus vaccines for the aquaculture industry. To achieve this, we study the innate and adaptive immune systems of Atlantic salmon and how they inhibit virus infection. Study of immune mechanisms are also translated into investigation of secretable exosomes from salmon leucocytes. These exosomes are nanometer-sized vesicles oftenly secreted during immune pathology and they contain different RNAs together with MHC I and II molecules. The research group is also responsible for the Aquamedicine study programme. For all current research focus - see the menu "Projects" above.